One of the first effects by Stefan Olschewski that were released to the magic market – finally available for instant download. An easy, small mental effect to take with you wherever you go. Entertaining and just a little bit different. 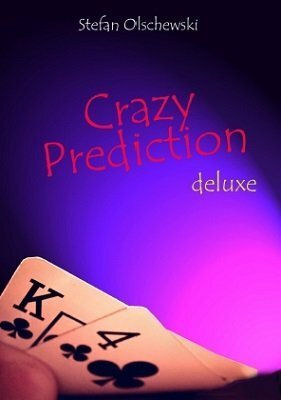 You show an envelope to the audience containing one single card as your prediction. A spectator is asked to keep the envelope. A second spectator chooses one card from a packet of ten. The funny thing is: all card faces are all the same, showing, for example, the 8 of Hearts. When the envelope is opened, the card inside also is the 8 of Hearts, of course. Don't worry, the real effect starts, when the laughter of the audience and silly comments have died down. You turn over the selection and the prediction to reveal that even the backs are the same. This is quite amazing, because now you start to turn over all the other cards. Each and everyone has a different back design. Only your prediction is 100 % correct. Crazy Prediction deluxe !